It is a pleasure to be here today at the European Central Bank in my capacity as chair of the Financial Stability Board (FSB) to help celebrate the Journal of Money, Credit and Banking’s(JMCB) 50th anniversary. The broad scope of the JMCB, and the diversity of its scholarship parallels, in some ways, the FSB itself. As we dealt with the global financial crisis, the heads of state and government of the G20 tasked the FSB with identifying and addressing vulnerabilities in the global financial system and developing stronger regulatory and supervisory policies to create a more resilient global financial system in the pursuit of financial stability. Our broad mandate has considerable overlap with the fields that the JMCB covers within its pages. The FSB includes 24 jurisdictions and 73 representatives, including all the members of the G20. Also similar to the JMCB, the FSB is celebrating an anniversary this year, with its creation having occurred 10 years ago. We are a far cry from the JMCB’s 50 years, but I hope that in time our continuing work–and not just our response to the late crisis–will prove valuable enough that we one day merit a similar celebration. I am especially pleased to speak at this conference today because the FSB welcomes and encourages the participation of the academic community in tackling issues of global financial stability. I would like to see a greater and more direct contribution of academic subject-matter experts to our work. You may have noticed that the FSB sent out a call for nominations last month for academics to advise our work in evaluating post-crisis reforms–in this particular instance, the evaluation that will examine the effects of the too-big-to-fail reform package that the G20 endorsed in 2010 and that the FSB and other standard setters have implemented since then. In our initiatives to examine the consequences of post-crisis reform, the academic community can help advance the field with analytical tools and critical insight. The financial crisis exposed fault lines in the financial system that had to be addressed immediately, comprehensively, and vigorously. The body of post-crisis regulation that resulted was founded on the work of academics, including important papers published in the JMCB, and involved the energy and efforts of many standard setters, regulators, supervisors, and central banks. It was an exemplary feat of cooperation and coordination, and it has unquestionably made the financial system safer and more resilient. Today, the post-crisis reform agenda has been largely completed. Basel III is final, the largest global banks have substantially more capital and liquidity, over-the-counter derivatives markets are safer, and steps have been taken to address the risks of too-big-to-fail institutions. Through greater monitoring and policy measures, the FSB is addressing risks from nonbank financial intermediation. And there has been remarkable progress on the difficult and unglamorous task of establishing workable resolution regimes that are consistent with the FSB’s clearly defined principles. While we must still work to ensure full, timely, and consistent implementation of the agreed reforms, it is time for the FSB to turn more of its energy and attention to the future. In my time with you today, I would like to do two things. First, I would like to share with you my view on how the work of the FSB must evolve if we are to merit that future celebration and some of the core principles that I think should inform that work. After discussing those principles, I want to focus your attention on some of the work priorities that the FSB will be addressing throughout 2019 and beyond, including nonbank financing, fintech, and evaluating the too-big-to-fail reforms. Let me turn to the core principles–engagement, rigor, and analysis. These core principles reflect goals that are both inward and outward looking. From within, FSB members have the occasion to reflect on how our work is executed–that is, we must ask ourselves how we can accomplish our mission more effectively, improving the financial sector’s ability to support economic growth without threatening financial stability. Outwardly, we will endeavor to reach out to a greater number of constituents and stakeholders for their input on the important financial stability issues they are encountering. This is also a good time to inform a wider public audience on the nature of our mission in a clear, articulate, and jargon-free manner. As the FSB pivots away from the urgency of post-crisis reform development, it is an opportune time to improve our efforts at effective engagement. Recognizing the wide-reaching effects of its work, the FSB must seek input from a broad range of stakeholders, each of whom brings a different perspective to the issues under consideration. While we are directly accountable to the G20, we are, through the G20, accountable to all of the people affected by our actions. In my view, that means we must engage in genuine, substantial dialogue with all of these stakeholders, to a greater and more effective degree than we have in the past. To start, we can strengthen the role of the six regional groups that are a part of the FSB organization. In 2011, the FSB established six consultative groups representing large regions of the globe–the Americas, Europe, the Middle East and North Africa, Sub-Saharan Africa, the Commonwealth of Independent States, and Asia. The intent was to expand its outreach program beyond the membership in a systematic manner to better reflect the FSB’s global mission. Each group meets once or twice a year and helps the FSB obtain broader input into its policy development agenda. These groups should be re-engineered to not only promote implementation of international policy initiatives within their respective regions, but also to be in a strong position to keep abreast of developments in financial markets and thus inform FSB policy. We have initiated a study of the operations of the regional groups that will help inform us on ways to upgrade their effectiveness as an outreach and feedback mechanism. I am particularly interested in how we can take lessons learned from this study to move forward with our enhanced engagement. Engagement outside of the FSB is also very important to our mission. We currently engage with businesses, institutions, market participants, and academics on much of our FSB work. For example, we have in the past conducted public consultations on FSB policy recommendations, albeit sometimes with very short timetables. We have now established an expectation that public consultation will be at least 60 days. We need to give the public adequate time to comment on FSB proposals, which can, at times, be quite complex. Beyond public consultation, we must convene more meetings with the private sector and academic community to build a more robust and meaningful dialogue. For example, we kicked off the work we have undertaken at the behest of the Japanese G20 Presidency to study differences in regulatory environments and market conditions across jurisdictions that may have financial stability implications–often referred to as “market fragmentation”–by hosting a workshop with key stakeholders and academics. This was quite successful, and I look forward to such interactions being the rule. In addition, we need to improve our interaction and cooperation with other standard-setting bodies, such as the Basel Committee, the Committee on Payments and Market Infrastructure, the International Association of Insurance Supervisors, and the International Organization of Securities Commissions (IOSCO). While we have worked together in the past, we all owe it to the global community to seek out opportunities for improved cooperation and engagement. To improve FSB transparency, we will be taking a number of important steps. For example, on February 12, 2019, the FSB published a comprehensive work program on its website for the year ahead.1 This is the first time in the FSB’s history that the work program was disseminated publicly. Over the term of my chairmanship, I will continue to look for steps that will allow all stakeholders to have a more open window into the FSB’s decisionmaking process and products. I believe improved transparency into the FSB process is critical to our mission. I’m reminded of Lord Hewart’s famous–and oft-quoted–remark concerning the importance of jurisprudence to the public: “Not only must justice be done; it must also be seen to be done.” We should be able to apply this concept to the field of global financial standard setting. The second principle I would like to discuss concerns how we assess and mitigate vulnerabilities in the global financial system. The post-crisis reforms addressed the fault lines that led to the crisis and the contagion effects felt around the world, but they will never replace the need for vigilance. If we are not rigorously vigilant, we still risk another crisis. What we need are forward-looking methodologies that use the most advanced analytical tools to spot vulnerabilities well in advance before they lead to widespread financial distress and economic costs. Here the academic community can continue to contribute with cutting-edge and robust modeling techniques. We can only mitigate financial vulnerabilities if we identify them accurately and in a timely manner. As such, the FSB’s Standing Committee on Assessment of Vulnerabilities under the leadership of FSB Vice Chair Klaas Knot of the Dutch National Bank will be directing a considerable amount of energy to developing a cutting-edge framework for the identification and assessment of financial vulnerabilities. Again, the principles of transparency and engagement will shape the work of the group. It is important that a wide spectrum of financial participants be brought into the process, from banks and nonbank financial institutions to financial regulators to national authorities and multilateral standard-setting bodies and the broad academic community. This task is essential to the mission of the FSB; financial developments move at a rapid pace, and being able to quickly and accurately assess vulnerabilities is essential if we are to take action to prevent future crises. Finally, the FSB members must employ a critical eye toward the effects of the regulations that have been put in place. Many of the reforms have been in place long enough for them to be evaluated. We can judge whether reforms are having their intended effects and making the financial system more resilient. Are any regulatory reforms causing unintended, adverse effects? Can we achieve the same, strong level of financial resilience with reforms that are more efficient, simple, transparent, and tailored? The FSB must champion efficient and effective regulation in order to maintain public support for the progress we have made. Now I would like to turn to three prominent issues on the FSB’s agenda in 2019. I will start with two relatively new issues that continue to evolve and grow in sophistication: nonbank financing and fintech, and then I will turn to the important work we are beginning on evaluating the effects of reforms aimed at ending too big to fail. I will loosely define fintech as technology-enabled financial innovation that results in material changes to the provision of financial services. As is often the case when technological innovation meets established business, fintech has attracted a great deal of attention, ranging from utopian claims to hostile skepticism. Claims about fintech’s promise abound: it has the power and potential to reduce economic inequality, increase financial inclusion, and boost economic growth. Through the introduction of new methodologies, greater information curation, and reduction in processing costs, fintech could potentially reduce financial volatility and vulnerabilities. We are already seeing significant changes to how many people around the world obtain financial services. For example, in Kenya, a mobile payments technology has introduced mobile wallets to millions of people, many of whom never had a bank account. In the United States, the largest mortgage provider is an online lender. In China, a technology firm started the world’s largest money market fund. Yet, alongside this growth in fintech, as my predecessor as FSB chair emphasized, we as regulators must ensure that as we maximize the potential benefits in the development of fintech we minimize the potential risks and costs. The FSB monitors and analyzes the financial stability implications of financial innovation as part of our mandate to identify and address vulnerabilities in the global financial system. Let me outline two areas that we have started to examine in greater detail: the potential effects from the entry of large technology firms into financial services and the potential effects from the growth in decentralized financial technologies. Over the last decade, the world has witnessed an explosion of large technology firms that are weaving themselves into our daily lives: for example, Facebook, Amazon, Apple, Tencent, and Baidu. Some of these firms are increasingly providing some financial services, such as payments, credit, insurance, and asset management. Their involvement can support financial services broadly. For example, their technology may increase speed and efficiency, and the ubiquity of their presence in our lives may allow them to offer financial services in a more convenient way or at lower cost to consumers. Further, as they are only dipping their toes into the edges of the financial services water, the effects they have on the provision of financial services could grow enormously if they were to dive in. Looking at the technologies that underlie some of the recent innovative financial products, we see a move toward decentralization–that is, a movement toward technologies that connect financial market participants directly without an intermediary. The potential areas of impact are broad: settling interbank payments; verifying and reconciling trade finance invoices; executing, enforcing and verifying the performance of contracts; and keeping an audit trail to deter money laundering. Both the potential entry of large, established technology companies into financial services and the ability of technology to decentralize financial transactions raise a number of issues, some of which may touch on financial stability. Technological innovation offers the promise of a substantially more efficient financial system. But new systems, processes, and types of businesses will bring with them novel fragilities. We continue to be responsible for ensuring that the financial system be sufficiently resilient that businesses and households worldwide need not fear the collapse of the system that serves their needs. These are open questions that need to be addressed, and because they touch on issues of financial stability, the FSB is putting significant resources into understanding these potentially important developments. To be clear, we are not trying to oppose innovation, because innovation, including fintech, offers the world many potential benefits. As the group charged with ensuring financial stability, however, we have to work to ensure that we can reap the benefits offered by these new technologies without harming financial stability. We hope to offer some answers to these questions in the coming years and to do so in line with the principles I outlined earlier. We will address the questions with discipline and analytical rigor in a way that incorporates the views of the public and key stakeholders and that results in answers that are practical and intelligible. The second issue I would like to discuss is nonbank financing. Since the global financial crisis, nonbank financing has grown relatively rapidly, in both its absolute size and its relative importance in intermediating credit. In the jurisdictions that the FSB closely monitors, nonbank financial assets are just under 50 percent of total global financial assets, a share that has grown by close to 5 percentage points since 2009. Nonbank financial intermediation (the artist formerly known as “shadow banking”) provides a valuable alternative to bank financing and helps to support real economic activity. Accordingly, the shift within the financial system toward nonbank financing represents a welcome increase in the diversity of the sources of lending to both firms and households. Even though the core of the financial system is much more resilient than before the global financial crisis, with strengthened bank capital and liquidity requirements, nonbank financing has been a source of systemic risk. Nonbank financing often features high leverage, maturity and liquidity mismatches, opaque structures, and concentrated holdings of risky assets. Nonbank financing can also lead to lower lending standards, bidding up the price of risky assets and sending an encouraging signal to credit underwriters. All of these channels played a role in the recent global financial crisis. More recently, new forms of interconnectedness between nonbank financial firms and the banking system have emerged that could, in some scenarios, act as channels for domestic and cross-border amplification of risks. Given these potential risks, and the large–and increasing–role for nonbank financing, we need to monitor closely its development. Is the growth of nonbank financing altering the existing market structures? Are there new vulnerabilities in the financial system? How will nonbank financing develop? To answer these important questions, the FSB is progressing on three related tracks. First, the FSB produces an annual report that outlines the developments in nonbank financing, detailing the global trends and potential risks. Second, the FSB promotes the resilience of nonbanks through the development of a range of policies to address systemic vulnerabilities where they arise, while not impeding the growth of sustainable nonbank financing models. In this way, we hope to promote resilient nonbank financial intermediation. The FSB, working alongside other standard-setting bodies such as the Basel Committee and IOSCO, is monitoring the implementation of these policies. Finally, knowing it is arrogant to expect that we got everything right the first time around, it is imperative that we start analyzing the effectiveness of the policies that have been implemented. How should we alter our policies? Have we modelled the risks from nonbank financing accurately? Have we missed a crucial new source of systemic risk? These are all questions that we must ask ourselves. The third issue that I would like to raise is the problem of “too big to fail”–that is, the perception by investors that some institutions will receive support from their governments if they become distressed. This weakens market discipline and allows such firms to become even larger, more leveraged and more complex. To address this challenge, the FSB and other global standard setters developed a framework and a set of policy measures intended to reduce the moral hazard risks posed by systemically important financial institutions. These measures are intended to make the financial system more resilient, for example through higher capital and liquidity requirements, while simultaneously allowing these institutions to fail without causing disruption to critical services, such as payments. A key element of the FSB’s policy measures to address too big to fail is its total loss absorbing capacity standard. Under this standard, the FSB introduced a bail-in (in contrast to a bailout) strategy that necessarily employs a gone concern or post-failure loss-absorbing and recapitalization capacity for the set of global systemically important banks. Crucially, by raising resolution standards, we have improved the potential for non-disruptive bank failure. The implementation of these standards is most advanced in the banking sector, especially for the largest globally important banks. The FSB established crisis management groups, collections of supervisors who monitor resolution plans of the firms. At the same time, we must be conscious that we have not actually tested the failure of a large bank in the marketplace–surely a good thing! Standing over a decade on from the start of the financial crisis, we must ask ourselves, how effective have we been at reducing the problem of too big to fail? Have we achieved our objective to reduce or eliminate the problem? Have we introduced new unintended risks to the financial system or costs to other financial market participants? To start answering these important questions, as part of its broader effort to evaluate the effects of reforms, the FSB is launching an evaluation of the effects of these too-big-to-fail reforms. We intend to bring analytical rigor to these questions, and we recognize that the academic community has undertaken much work in this area. As a result, we will draw extensively on academic advisors during all phases of the work we are undertaking. I also encourage other experts in this field to look closely to the consultative document that will be coming from the study next year. We welcome the input as we undertake the study of this signature issue from the crisis. Let me conclude by reiterating some of the broad themes I intended to convey today. First, I touched on some of the key principles that I hope will guide the FSB work while I am chair. Those principles include expanded engagement with a broad range of stakeholders and experts, rigorous and careful examination of financial vulnerabilities that may threaten our financial system, and analytical examination of past reforms to ensure that they are making the financial system as resilient as it can be in the most efficient manner possible. Second, I shared some of the key questions we are working on relating to the rise of large technology firms in the financial sector and decentralized financial technologies, the growing importance of the nonbank financial sector, and our burgeoning efforts to look at how well we have addressed too big to fail, the signature issue of the recent financial crisis. Moving forward there will surely be additional issues to address and areas to examine.a During my time as chair of the FSB, I hope to make progress not only on the areas I have outlined but on a range of forward-looking issues and continue to demonstrate the value of the FSB. International standard-setting bodies serve an important role within our global financial sector, and I look forward to the FSB advancing our progress and work in these areas. The Basel Committee today published the results of its latest Basel III monitoring exercise, based on data as of 30 June 2018. Through a rigorous reporting process, the Committee regularly reviews the implications of the Basel III standards for banks, and has been publishing the results of such exercises since 2012. The report sets out the impact of the Basel III framework that was initially agreed in 2010 as well as the effects of the Committee’s December 2017 finalisation of the Basel III reforms. However, it does not yet reflect the finalisation of the market risk frameworkpublished in January 2019. Data are provided for a total of 189 banks, including 106 large internationally active banks. These “Group 1” banks are defined as internationally active banks that have Tier 1 capital of more than €3 billion, and include all 29 institutions that have been designated as global systemically important banks (G-SIBs). The Basel Committee’s sample also includes 83 “Group 2” banks (ie banks that have Tier 1 capital of less than €3 billion or are not internationally active). 1 January 2022 and fully phased in by 1 January 2027. 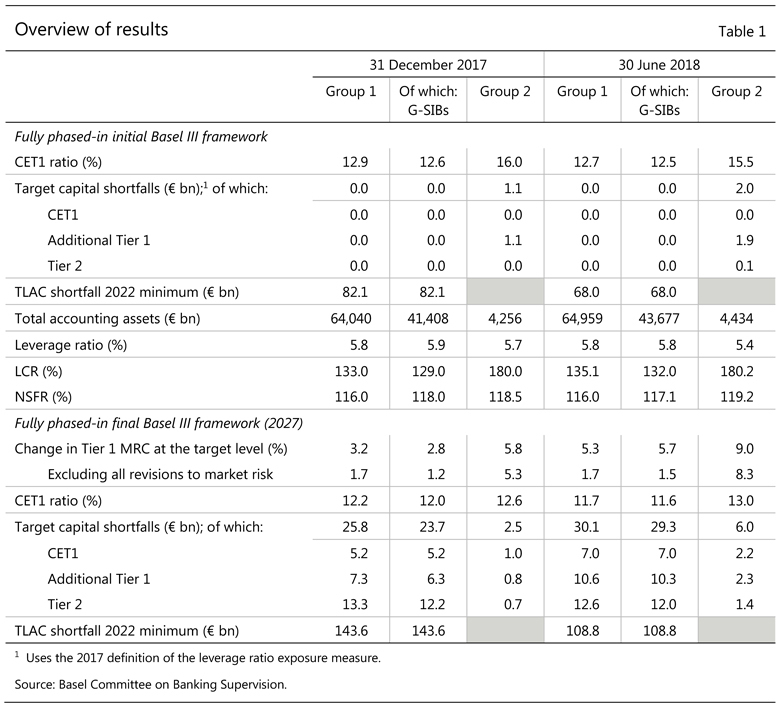 On a fully phased-in basis, the capital shortfalls at the end-June 2018 reporting date are €30.1 billion for Group 1 banks at the target level. These shortfalls are more than 70% smaller than in the end-2015 cumulative QIS exercise, thanks mainly to higher levels of eligible capital. For Group 1 banks, the Tier 1 minimum required capital (MRC) would increase by 5.3% following full phasing-in of the final Basel III standards relative to the initial Basel III standards. This compares with an increase of 3.2% at end-2017. The increases in both shortfalls and the change in MRC over the last six months are driven partly by a higher market risk contribution; this does not yet reflect the finalisation of the market risk framework published in January 2019, which is expected to offset the increases to some extent. By excluding all revisions to the market risk framework, the current end-June 2018 data show increases in Tier 1 MRC of 1.7%, 1.5% and 8.3% for Group 1 banks, G-SIBs and Group 2 banks, respectively, compared to 1.7%, 1.2% and 5.3% six months earlier. G-SIBs, as applicable). In addition, applying the 2022 minimum requirements for total loss-absorbing capacity (TLAC), six out of 24 G-SIBs reporting TLAC data have a combined incremental TLAC shortfall of €68 billion as at the end of June 2018, compared with €82 billion at the end of December 2017. 30 June 2018, compared with 133% six months earlier. For Group 2 banks, the weighted average LCR remained almost stable at 180%. All banks in the sample reported an LCR that met or exceeded the final 100% minimum requirement. Basel III also includes a longer-term structural liquidity standard: the Net Stable Funding Ratio (NSFR). The weighted average NSFR for the Group 1 bank sample remained stable at 116%, while for Group 2 banks the average NSFR increased slightly to 119%. As of June 2018, 96% of the Group 1 banks and 95% of the Group 2 banks in the NSFR sample reported a ratio that met or exceeded 100%, while all banks reported an NSFR at or above 90%. I, too, would like to warmly welcome you all to this year’s Bundesbank banking symposium. Today is a premiere for me, since it is the first time that I have the honour of hosting this event. I would like to use this opportunity to tell you what I see, in my capacity as a banking supervisor, and what the Bundesbank sees as the key challenges facing Germany’s banking sector at the moment and in the medium term. Although acute problems tend to keep us busy on a day-to-day basis, I mainly want to identify prospects with you here today. Let me put the question like this: imagine we meet here again in five years’ time – which of today’s challenges will still be on our agenda? Looking more to the future makes particular sense in 2019, because what we are currently experiencing is a turning point. The focus over the past decade has primarily been on learning the regulatory and supervisory lessons from the financial crisis. Now this ambitious set of reforms is largely drawing to a conclusion, in the shape of the European banking package and the implementation of the final piece of Basel III. It will admittedly take a few more years to put everything into practice, but there is not much more in the pipeline for the time being. That’s why, for me, 2019 is also a year for staking out new topics – or, to use business-speak, for “agenda-setting”. And that is why I feel we now need to look more at issues which will shape the future – such as structural change in financial markets, digital transformation and the evolution of the economic and political setting for you and for us. I would therefore like to organise my introduction in three sections. First, what will pass? These are the topics which are still very important today, but will probably be a thing of the past in five years’ time. Second, what will still be around? These are the issues which we are still some way from overcoming. And third, what will come? These are the topics I expect to grow in importance and to occupy us even more than they do today. Let’s kick off with the issues that will pass – that is, the topics which are keeping us busy right now, but will hopefully be yesterday’s news at the Bundesbank’s 2024 symposium. There are three areas I see here. First, five years from now, will we still be talking about the regulatory reforms enacted in the wake of the financial crisis? I don’t think so. I’m very confident that we will have wrapped up and implemented most of the regulatory projects and grown quite accustomed to operating within the new framework. The final pieces are just being added to the regulatory puzzle. As things stand at present, the EU’s banking package will be signed off before the elections to the European Parliament in May, thus implementing the components of the 2010 Basel III package. The leverage ratio and the net stable funding ratio, or NSFR, will be established as binding minimum requirements going forward. Another initiative which is in the process of being implemented is the Basel Committee’s new rules for market risk – the Fundamental Review of the Trading Book (FRTB). The total loss-absorbing capacity provisions incorporated into the banking package will provide tailwinds for derisking in the banking union. This doesn’t mean that risk reduction has been concluded yet, of course. But it makes me optimistic that the remaining risks are also being addressed with the determination and commitment they deserve in Europe’s banking union. However, this leaves one fairly major item for the Bundesbank which we likewise need to wrap up over the coming years. I’m talking about the important subject of proportionality – that is, the matter of easing overly severe operational burdens for small, non-complex institutions. This is an area in which we have succeeded over the past two years to forge a common understanding at the European level. For instance, the banking package now includes a definition of “small, non-complex institutions” – these are institutions with total assets of €5 billion or less which also satisfy a number of qualitative criteria. That means we have successfully addressed the basic issue of the regulatory importance of proportionality and its implementation. The foundations have been laid for easing the burden on institutions precisely in areas where the administrative effort is disproportionate to the supervisory gains. The second topic which is on the finishing straight is implementation of the package finalising Basel III in Europe, which has been agreed for the beginning of 2022. So the end of the “Basel marathon” is within our sights. A comprehensive impact study is under way. Thank you to all the institutions which participated in this arduous exercise. The investment will pay off. You see, the new Commission that will be assembled after the European elections will table a draft bill based on the findings from this impact study. But if we really want to put this reform agenda to bed once and for all, we will have to implement all the global agreements, without exception. Two thoughts spring to mind here. First, this opportunity to strengthen banking sector resilience is one we should not squander. Second, by unrestrictedly implementing the Basel standards (which are, of course, non-binding in legal terms) we need to rule out for ourselves any pretext which allows others to deviate from the rules. Otherwise, a project that has been achieved with a great deal of time and effort – and is unique in terms of global economic regulation – will be at stake. Particularly in light of the dangers to multilateralism, we need to be committed advocates of global standard-setting – in our own interests and for the common good – including in the way we put these standards into practice. I’ll be the first to concede that for some institutions, these reforms will put more work on their plates. Just take the output floor, which is having a clear impact on a number of larger institutions running riskier business models. That said, the necessary adjustments are doable, and they’re warranted, too, in light of these institutions’ risk profiles. And for many institutions, the additional capital requirements introduced by the reforms are in any case on the low side – for smaller and medium-sized banks they come to 5.7% on average. Some institutions will even see their capital requirements decline. Let’s turn to the third topic that will pass. In all likelihood, the United Kingdom will, at least in five years’ time, no longer be a member of the European Union; and London – this is something I firmly believe, unlike others – will no longer perform the role it plays today for the EU as a financial centre. On the continent, credit institutions and other financial agents will have expanded their operations and interconnected their activities to such an extent that they will be taking on essential functions currently performed out of the City – from wholesale banking to clearing operations. You will need to be ready for this. The new capabilities and the new agents will drive another wave of structural change in markets and competition in the German financial markets, above all here in Frankfurt. That’s something you will need to prepare for. The transition won’t be easy – but as a financial market we’re better prepared than other sectors. You, just like the legislators in Berlin, Brussels and Strasbourg, and we, the European and national supervisors, have seen to that. Five years from now, we will hopefully no longer be tearing our hair out over short-term transitional problems. 3 What’s here to stay? Let’s begin with earnings. Fierce competition in Germany’s banking sector combined with slim margins have been a perennial topic for many years now – particularly given the low interest rates. And things are not going to change in a hurry. That, too, is something you will need to prepare for. Let me be totally frank here: your business model also needs to function when interest rates are low. Judging by your 2018 balance sheets, I can see that many of you, though not all, have been diligently doing your homework. You can expect monetary policy – which came under intense fire again recently due to the repercussions for banks – to remain geared exclusively to the goal of price stability. Forgive me for saying it, but you cannot expect policymakers to take account of the earnings prospects of certain economic agents, even if we do see the side effects, of course. Altogether, though, there’s no reason to constantly speak ill of Germany’s banking market. The institutions are robust, their portfolios are solid, and they are well capitalised. Or, as “The Banker” wrote recently, Germany’s market is characterised by “liquidity strength [and] strong asset and funding structures”. These qualities make us the envy of others, and that’s something we can even be a little proud of. As a supervisor, let me say that as long as enough capital can be built up, earnings aren’t everything. If I may say so as a Bundesbanker taking a bird’s eye view, diversity – and thus the fierce competition – provides rich rewards for the economy as a whole, even if it is making life difficult for you. “The three-pillar system has served the country pretty well,” is how “The Economist” recently summarised Germany’s situation. It is thanks to you that the supply of credit and other bank products and services to the real economy has run smoothly ever since the upswing started in 2009. To put an even finer point on it, you could say that although Germany’s banking sector gets funny looks in some quarters, it has been a veritable godsend for the country’s economy. But still, profitability remains a perennial challenge. Not every institution has sound earnings potential – and this needs to be improved. No one should pretend they can’t challenge key aspects of their business model. And that’s why consolidation – which is my second point in this section – will also remain on the agenda. Mergers can be a powerful tool for absorbing hefty administrative expenses. And they have been deployed, frequently, for decades now. The number of credit institutions in Germany has been declining steadily since the early 1990s, dropping from nearly 4,500 in 1991 to around 1,800 today. And that number will dwindle further still. But mergers are not the only consolidation tool. Far too little attention is paid to the efficiency gains that have already been tapped in Germany by centralising individual elements of the value-added chain – and are still there to be tapped. This can be done within institutions, in groups of institutions, by forging cooperations or outsourcing operations to third parties, and even across borders. There remain a great many opportunities for you to seize here, especially if you put innovative technologies to use. Innovative forms of collaboration among standalone institutions are often more worthwhile than mergers between traditional institutions. This is a trend which we supervisors want to support by designing our outsourcing rules accordingly. Like other sectors of the economy, the banking sector also experiences waves of structural change. Mergers and acquisitions are one manifestation of such processes. Last year alone, 53 banks merged in Germany. Many of you will have initiated and implemented transactions of this kind and can report from your own experience on how much effort and skill is needed to produce a successful outcome. Further mergers are probably on the cards, and the options are currently the subject of intense public debate. Owing to recent events, I feel it is important today to say that we supervisors are neutral when it comes to bank mergers. We may monitor such processes, but we certainly do not initiate them. You are aware of that, but perhaps there are some sections of the public arena which are not. The initiatives for mergers and acquisitions and their design are matters for the management of the institutions and their owners. Supervisors only come into play when we are presented with a plan. The law states that mergers require the approval of the supervisory authorities, whose job it is to check whether the new institution satisfies the regulatory requirements now and in the future. That calls for a sound and sustainable business model. The assumptions and projections made in the business plans presented to us will therefore be subjected to thorough analysis. As in all banking supervisory matters, you and, of course, the direct stakeholders in particular can count on our constructive and critical involvement. You see, banking supervisors can only play a constructive role if they are inquisitive and analytical – in keeping with their duty towards the institutions and society as a whole. We have a commitment to society and the general public to preserve stability, solidity and security in the consolidation process. As in the past, this is a commitment we will also take very seriously in future mergers. However, what mergers cannot resolve is a more deeply seated challenge facing the German banking market: the liquidity surplus. A bank needs to invest these funds it is unwilling to pay us the negative interest rate of 0.4%. Competition is therefore fierce, and it wouldn’t get any easier with only half as many institutions in the marketplace. Let me move on to my third topic, which is not digitalisation but digital transformation. Because what lies ahead of us over the next few years is more than just a few fancy apps. We can barely grasp the sheer momentum of the digital change which will transform the world, and it’s certainly impossible to overstate its impact. Five years from now, fintech players won’t be like creatures from outer space, but linked organically with traditional institutions. Furthermore, whole new dimensions look set to open up. Who today can predict the possibilities that blockchain, BigTech and changes in customer behaviour can bring? This has a consequence which is not at all new but can blow up into something dramatic: business models not only have to be revised and updated, but sometimes have to be taken back to the drawing board. And they have to be capable of being constantly retooled. Transformation impacts on us as well, in our function as supervisors. If you, the supervised institutions, fundamentally overhaul your business model, working methods and thus your risk profile, we need to ask ourselves whether our prudential toolkit and practices are still fit for purpose. Not to block, or slow the pace of, transformation. In fact, the opposite is true. We want to enable you to harness the opportunities offered by the innovative technologies without endangering the hard-won stability. To achieve this, we need to engage in greater dialogue so that we can better grasp what’s happening in the digital world and thus respond to developments in a more purposeful manner. Let us now look a bit further into the future. What concern me now are topics that are certainly well known today, but whose medium and long-term importance, I feel, will be greater than many anticipate, and will still be making smoke come out of our ears in 2024. Allow me to cite three topics from a wide range of areas. The first topic is actually more of a textbook example, but it always tends to be brushed under the carpet when times are good: cyclical risk. A long period of strong growth and low interest rates is behind us. It doesn’t take a prophet of doom to tell you: this won’t last. The problem is this, though: it is precisely in times when the economy is booming that the probability of things turning sour in future is cast aside all too easily. However, there is no doubt that in these years where the economy has been “fat” and interest rates have been “lean”, vulnerabilities have been accumulating in the German financial system. An unexpected – or unexpectedly strong – economic downturn could simultaneously expose vulnerabilities in multiple areas. Rising losses from credit defaults and heightened risk provisioning would mean falling values of assets and loan collateral. Losses would eat into banks’ available capital buffers. Banks would also have to hold more capital in order to meet regulatory or market requirements. Over the short term, banks would attempt to achieve these goals by constraining lending. This could further amplify a cyclical downswing. I’ll be the first to concede that the interrelationships I’ve just described are “old hat” to you. Yet I still believe it’s important to highlight the vulnerabilities. After all, even though the medium-term outlook for economic growth is currently not all that bad, that can change sometime. Now is therefore the time to take precautions. It helps that banks have already built up buffers – thanks in no small part to stricter regulation. Currently, the low interest rate environment is creating competitive incentives, particularly in commercial banking and commercial real estate finance, to ease credit standards. I expect market participants, for all the investment pressure they are facing, to show a certain degree of discipline so as not to worsen the quality of their portfolios as a whole. It is important, then, for you not to let up in your efforts to keep strengthening your buffers and thus to boost the financial system’s overall immune system. We at the Bundesbank have our eyes clearly trained on the outcome of these efforts, including where the regular review of the deployment of macroprudential buffers is concerned. Ladies and gentlemen, when looking into the future, we should also detect entirely new sources of risk as early as possible – those that do not show up in historical data. One example I am thinking of is the risks of climate change. Such risks were at the core of last year’s symposium. The topics of green finance and sustainable finance have picked up an enormous amount of steam at all levels since then. I would particularly like to draw your attention to the report of the Network for Greening the Financial System (NGFS) group, which will be published on 17 April 2019. You might be aware that the Bundesbank is one of the NGFS’s founding members. The topic is not a “flash in the pan”, and now is the time for you to take it seriously. As a risk, for one thing. For physical and transitory risk can be the source of credit risk, market risk and operational risk. To a point, this is uncharted territory, and I am aware of the difficulties relating to data and methodology. There is still a lot of knowledge and methodological expertise that needs to be collected. However, that is no excuse for putting off addressing climate risk. For another, you should view green finance as an opportunity. It is also about acquiring market share – about who is able to meet the growing demand for sustainable financial services. Some countries are making great strides – examples I am thinking of include China and the United Kingdom. The EU needs to make sure it doesn’t fall behind on this score. That’s why we expressly welcome the initiatives which Brussels has put forward here, and why the Bundesbank is an active participant in this debate. We are, however, keeping a very close eye on ensuring compliance with the principle of risk orientation. This is a test that any new regulation in the field of sustainable finance has to pass. But another thing is clear: not every proposal floated at the European level in the past few months is fully baked and ready to be served up to the real world. For this reason, institutions and associations also need to play their part in greening Europe’s financial sector. Shaping, and taking the long view, are also at the heart of my third and last point: designing the European financial centre post-Brexit. I am convinced that we need a European strategy to deepen and modernise the internal market for financial services. Our objective should be an interconnected European financial market which not only spurs competition internally but is also a global force to be reckoned with. I’m hoping for a financial ecosystem which is spread out over several sites and in which national, regional and local specialisation is possible, yet where actors and services are part of a single, interconnected market. Such an internal market would be able not only to close the gaps created by London’s departure: such a joint financial centre would also help keep significant financial flows under European supervision and enable us to ensure the protection of financial stability thanks to our high supervisory standards. All these considerations on what comes beyond the capital markets union during the next European legislative period need to be priority issues which the second panel will discuss after lunch. A change of perspective towards the future can help us to put into perspective the numerous challenges facing banks and savings banks now. Out of the many pertinent topics, I have touched upon nine. Some topics that are still the subject of lively debate today might be self-evident five years down the road – think of Basel III. Other topics which are already on the agenda today will not be nearly as easy to consign to history – think of structural change and digital transformation. And other topics, in turn, deserve even more attention than they have been getting thus far – think of climate change and the design of the European financial centre. As Willy Brandt put it: “The best way to predict the future is to create it.” The future won’t just happen – all of us in this room can shape it if we confront it at an early stage. I am expecting this day to provide much impetus for dealing with the future. In closing, let me say that I am looking forward to a rich and rewarding symposium and to many inspiring discussions here in the auditorium and outside in the lobby about how, through common action and joint dialogue, we can shape the future of banking and finance in a way that benefits everyone here and in the wider community.